The Salon Sarah team is comprised of experienced hair stylists and colorists who are truly passionate about crafting gorgeous hair. We strive to celebrate the unique beauty and individuality of every guest and look forward to exceeding your expectations. Our salon strongly believes in the pursuit of continuing education, so that we may better serve you. Salon Sarah hair specialists stay up to date with the latest trends in hair fashion, styling, and use of the most cutting-edge Redken professional hair care products. We foster an environment that is truly unique – one where we carefully listen to your needs, unleash our talents and creativity to realize your very best look, and deliver uncompromising customer service in a relaxed, welcoming space. Allow us to provide an amazing salon experience for you. This year we celebrate 19 years serving Sun City and the wider Georgetown, Round Rock, Cedar Park, and Leander, TX communities. We hope to have the privilege of serving you. 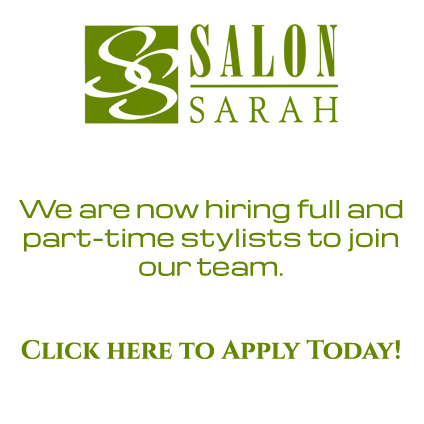 Call us at (512) 864-0869, and experience the Salon Sarah difference for yourself. Give the gift of great hair! Our instant gift certificates are ideal for holidays, birthdays, and anniversaries, as well as a thank you to employees and business clients. Pick a design, personalize it, and then email or print it instantly!